If you are an existing member covered by transitional protection following the removal of the Rule of 85, retiring before your Normal Pension Age will entail a slightly more complicated calculation of benefits as it did when the LGPS 2009 was introduced. To have Rule of 85 protection you must have been a member of the LGPS on 30 November 2006. 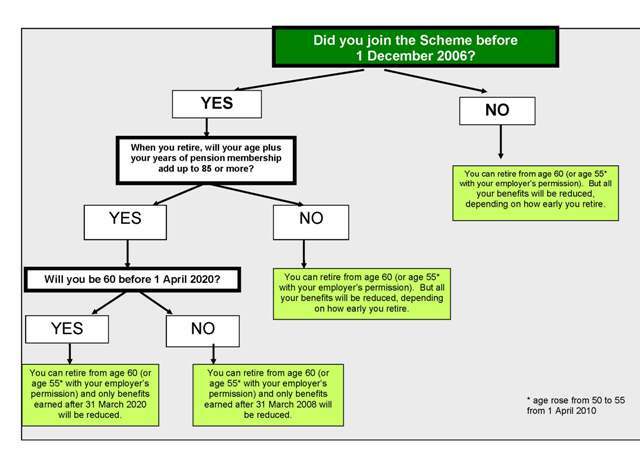 The 85 year rule is satisfied if your age at the date you draw your benefits and your scheme membership (each in whole years) add up to 85 or more. If you are part-time, your membership counts towards the rule of 85 at its full calendar length. Not all membership may count towards working out whether you meet the 85 year rule. Working out how you are affected by the 85 year rule can be quite complex, but this should help you work out your general position. If you will be age 60 or over by 31 March 2020 and choose to retire before age 65, then, provided you satisfy the 85 year rule when you start to draw your pension, the benefits you build up to 31 March 2020 will not be reduced. If you will be under age 60 by 31 March 2020 and choose to retire before age 65, then, provided you satisfy the 85 year rule when you start to draw your pension, the benefits you’ve built up to 31 March 2008 will not be reduced.